Thyagarajan Bhoopathy from Chennai, B.Sc Graduate. PAYROLL & COMPENSATI.. SEPARATION FOMALITIE.. ONBOARDING FORMALITI.. EMPLOYEE ATTENDANCE .. EMPLOYEE BENEFITS HANDLING CUSTOMERS .. OFFER GENERATION BUSINESS PARTNERING TALEND ACQUISITION FULL & FINAL SETTLEM..
are one of expert skill area's of Thyagarajan Bhoopathy . 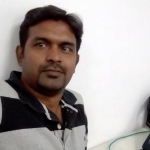 Thyagarajan Bhoopathy is working in IT Software industry.